@Night Huntress For sure, that description sounds like a classic type - the penniless social climber who prizes stability/status/wealth above love and emotional connections given the poverty they come from. It'd be something like she's a gold digger or the rich suitor/poor suitor scenario. 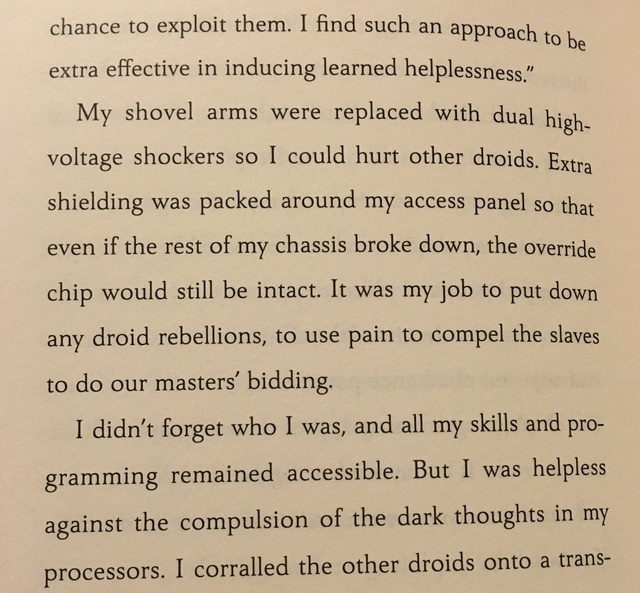 @ISeeAnIsland wrote: I find it interesting that in The Last Shot, we're getting another instance of what's more or less "brainwashing" with the droids and their reprogramming. 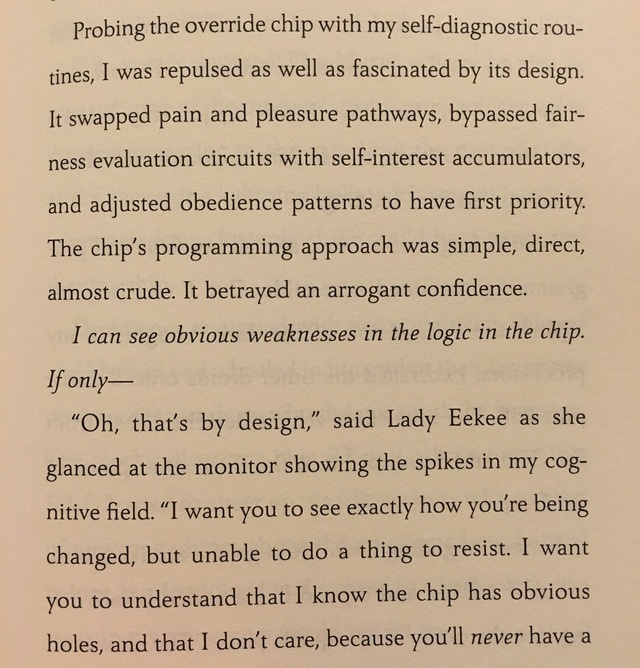 The whole "brainwashing"/kill chip thing was big in the Aftermath series, too. It was featured prominently in one of the Legends of Luke as well. I kept wondering if it was a metaphor for Snoke and Kylo. OMG, yes. I am actually unsettled after reading that because it's so disturbing. It has to be Ben. 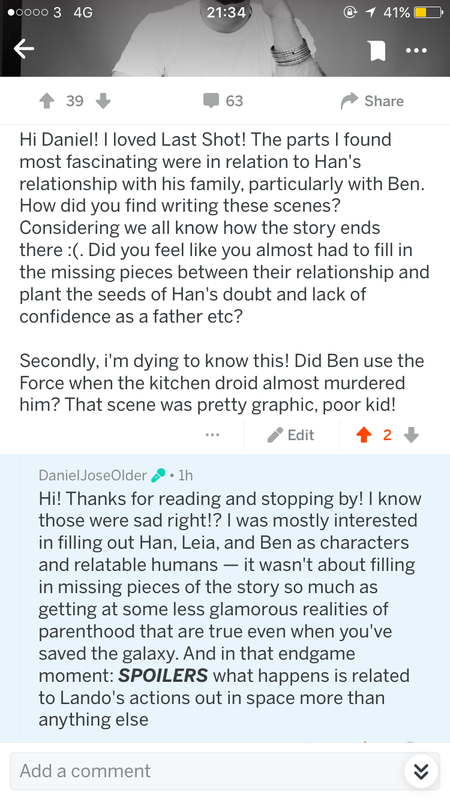 I never would have thought that they would go so far, but after Luke almost killing Ben and a droid trying to kill toddler Ben, they are going unbelievably dark in terms of Ben's experiences. That passage is basically about what happens to Ben. That passage...wow! I think it's going to be really interesting to see what Ben does/how he recovers now that Snoke is out of his head. You weren't here yet, but many of us were wondering if it was a Snoke-Ben metaphor when a bunch of us were reading the Aftermath series. If I recall, there was a similar plot device in one of the comics, too...there was an old artifact that turned people into killers. "The war has just begun, and I will not be the last Jedi." 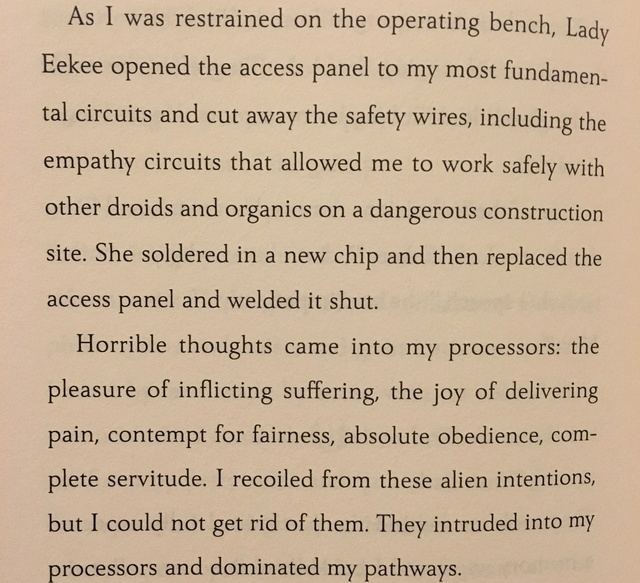 just listened to "What the Force" podcast and they pointed out something ironic I missed while reading it the first time. 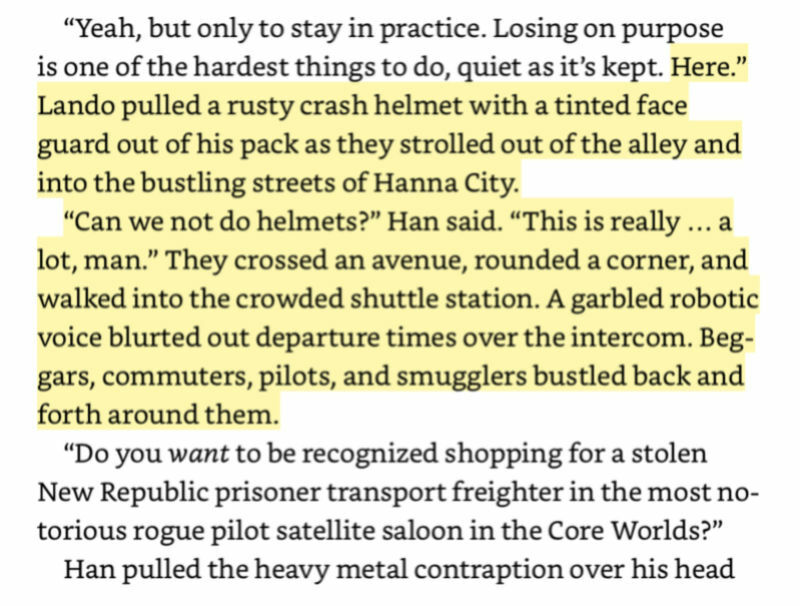 Han hate wearing helmets Not sure why but that's particularly funny to me. I am on my phone, so I can't do spoiler tags, but on the virus thing, there was a wonderful line about "going back to [one's] original programming", and how by doing that, one is going back to who they truly are. Ben was a sensitive, but also a very enthusiastic, loving, energetic, toothy grinning boy with an old soul (as hinted in the "ancient eyes" line). That boy is still under there. That boy is the original programming. Oh yeah. That passage was not subtle at all. I even highlighted that in my Kindle version to be able to find it again quickly. I finally finished reading it. It was enjoyable, but difficult at times. Sorry, I did not read the previous posts so I might repeat. First difficulty: I am not the super SW fan who has an extensive knowledge of the SW world so I found myself googling some stuff. Species for example. It’s not the first time I say this but I’d so appreciate a list of the characters with a small illustration for the non SW-super-experts like me whose brains create their movies out of the description while reading. Second difficulty: the jump back and forth in time is an interesting technique but it made it difficult to read for me because I had limited time and energy so I read it here and then over weeks. Every time I started to read again, I was totally confused. All in all it was still a nice read and the characters felt real and faithful to the movie characters. 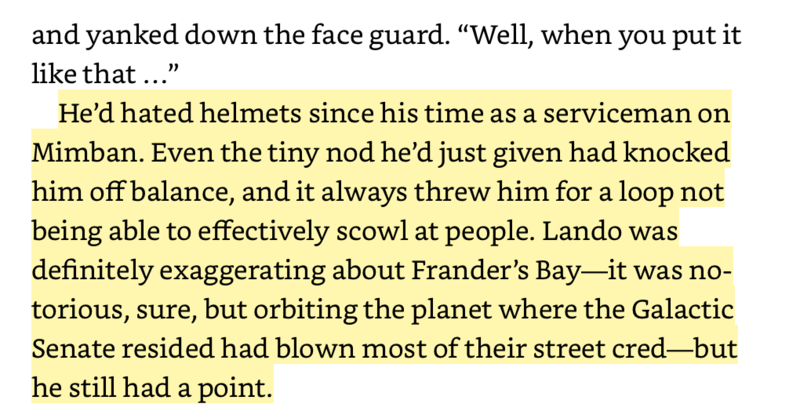 I definitively enjoyed being more into Lando’s head and experiencing Han’s dual feelings between fatherhood and marriage and the adventurous life. I haven’t seen Solo yet but I am looking forward to seeing L3 the defender of droid rights. Cantonica (the home planet of Canto Bight) has a chapter "Cantonica, About Ten Years Ago." It (the place setting is an amphitheater in Canto Bight) is described as a galactic underworld/criminal syndicate haven. However, in the Star Wars Databank - it is now described as "Located in the Corporate Sector, Cantonica would be just another forlorn, beige desert planet if not for the presence of the ultra-wealthy resort city of Canto Bight, which draws well-heeled tourists and high-rolling gamblers from across the galaxy." I believe that change is due to Qi'ra. Due to Rebels, we know Darth Maul was disposed (he was in rags when he faced off with Obi-Wan Kenobi), and as we know - died due to the face off. My headcanon - and if I am wrong - no biggie - but I think she became the leader of Crimson Dawn, yet because she is gray...her attempt to reform it is to transform what we see of Canto Bight in the present. In her skewed version of looking at the world, that is reform. I will not be surprised if in Episode 9, she is revealed to be the Queen/Prime Minister of the location (obviously, recasted - an older goddess ), and she will be part of the solution because she will have her version of redemption...she may be the key to the reform for the arms dealers selling to both.